Crack Width Gauge | Concrete Crack Width Ruler - Gilson Co.
HM-636 Crack Width Gauge measures width and length of cracks in concrete structures and pavements, as well as other structural materials like plaster or drywall. The durable clear polycarbonate gauge is scaled on one side with black marks for direct comparative measurement of cracks from 0.1 to 7mm (0.004 to 0.275in) wide. 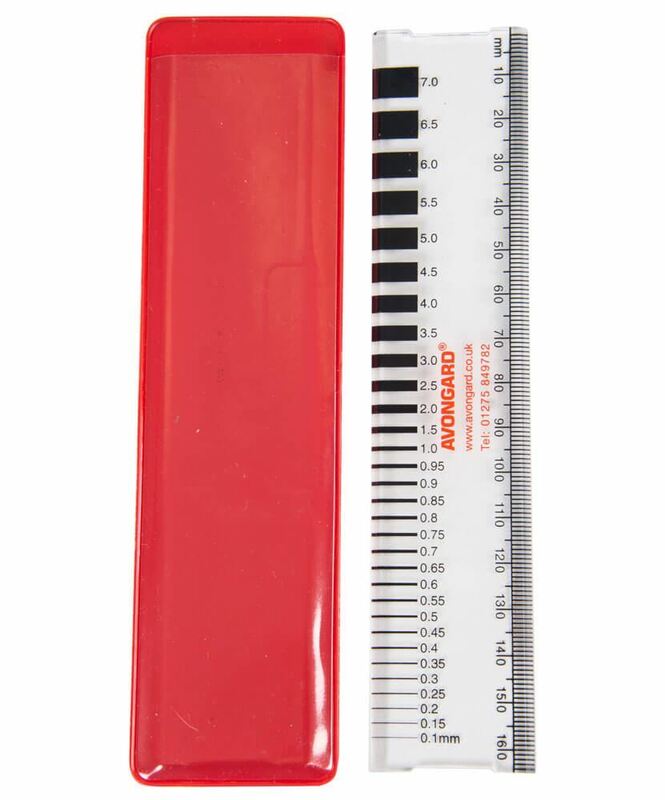 The opposite side is marked in clear 1mm graduations up to 165mm (6.5in) and is easy to use for width or length measurements of cracks, even in tight corners. The width gauge is available separately or as a component of Gilson’s Crack Monitor Kits. Supplied with a protective plastic sleeve. Dimensions are 6.5x1.25in (165x32mm) LxW.